Flexpak has the ability to give customers high graphic bags at small runs. These bags are mainly for prototype runs on poly bags for the home improvement section, and work great for customers looking for soil bags, salt bags, fertilizer bags, wood chip bags, or other types of specialized bag packaging needing high graphic print. Flexpak can manufacture prototype runs that beats the competition in small quantities. 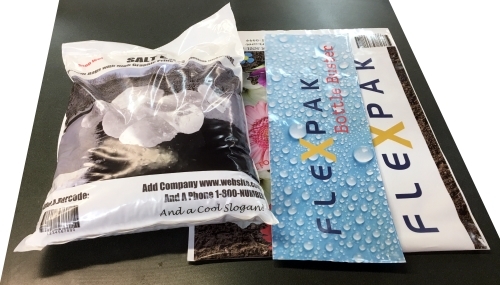 If a customer is looking for a printed industrial bag, Flexpak has developed its unique ability to print and heat-seal, combining the effort to produce bags that no other company to date has been able to with Polyethylene.